Mastro’s City Hall Steakhouse is a classic in the very best tradition of American fine dining. The elegant and fashionable décor comes together seamlessly, with beautiful etched glass and polished wood, custom light fixtures, and white linen tablecloths. The menu, while traditional in its emphasis on prime beef and chops, is enhanced with many contemporary twists, such as inventive sides like lobster mashed potatoes and gorgonzola mac and cheese. Located near downtown Scottsdale, Mastros provides an ideal destination for both casually chic and special occasion dining. 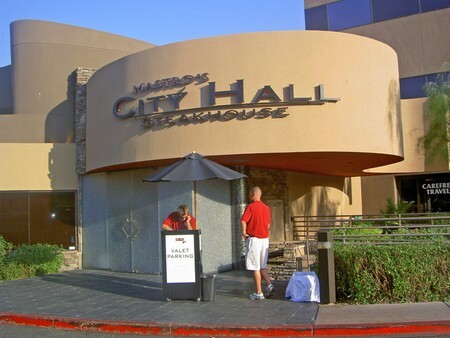 Mastro’s City Hall Steakhouse is located in Scottsdale on Camelback Road just south of Scottsdale Fashion Square Mall. The restaurant opened in 2002 and was originally named Drinkwater’s City Hall. Although the restaurant has always been associated with the Mastro's group (Mark Drinkwater and Mike Mastro co-own it), the name was changed in the Spring of 2007 to reflect the same continuity, name familiarity, and standard of service offered at other Mastro's restaurants in Arizona and California. Executive Chef George Harrison has run the kitchen since the name change in 2007. From the moment we enter the softly lit, dark-paneled entrance I suspect we are in for an evening of elegance and refinement. The warm wood paneling surrounds the walls and introduces us to the main dining room. I marvel at the individually etched panels of glass, each bearing unique designs. White linen tablecloths contrast with black linen napkins and comfortable black dining chairs. Despite a lack of paintings, I feel as though I have entered a contemporary art gallery. The pièce de résistance to this décor is the stunning hand-blown glass chandeliers created by contemporary Scottsdale glass artist Newt Grover. A full complement of table crystal includes miniature candle lamps at each table. The meticulously set tables coupled with the elegant interior infuse us with a warm glow and seem to promise a hedonistic dining experience. Immediately to the left of the refined entrance is Mastro’s large, rectangular bar. The same beautiful wood trim and décor define this room. Black-and-white tables, taller but similar to those in the main dining area, surround the long, sleek, rectangular bar. Even the four obligatory television screens at the top of the bar (one facing each direction of the large rectangle), cannot detract from the romantic recessed lighting and chic atmosphere. The live piano music coming from the bar’s baby grand piano and the beautifully laid tables still afford the same dining experience as that offered in the main dining room. Clearly, this is a popular place to meet or bring a date. Just outside the bar is an informal patio with a stone fireplace available for outdoor dining or drinks. For martini lovers, this is the place! Mastro’s features a number of unique martinis, including a “City Hall Chocolate Martini” and a “C.E.O.Martini” with Chopin Vodka and extra olives. The wine wall is a joy to behold and is visible at the end of the main dining room. Behind glass panels, the bottles reside in wooden drawers inside Sub-Zero refrigerators. There are one hundred and forty vintages, forty of which are offered by the glass. The restaurant’s standard pour is a hefty eight to nine ounces. The wine is predominantly Californian but the selection also includes a large array of wines from France and the Pacific Northwest. A few other international wines are also available. The long wine list provides a diverse selection for pairings with Mastro’s extensive array of menu items. Our service is solicitous and efficient and is performed by Jeffery, Matthew, and their well-orchestrated team. The meal begins with a beautifully presented bouquet of breads served warm with butter in a round basket. The mix of crostini, pretzel bread, and sourdough is artfully arranged and tastes as good as it looks. There are at least 25 starters and first course items to choose from, making our appetizer decisions delightfully difficult. The list includes traditional favorites, such as Oysters Rockefeller and Shrimp Cocktail, and colorful starters such as Ahi Tuna Tartare. We chose French Onion Soup and Crab Stuffed Mushrooms. The French Onion Soup arrives in a pewter tureen and tastes authentically Parisian. Lightly salted, with hearty beef broth awash with sautéed onions and infused with savory seasonings, it is topped with a gooey crust of baked cheeses. The Crab Stuffed Mushrooms are served on a small hot skillet with six large plump and pretty sautéed mushrooms. A bouquet of lemon is artfully displayed in the middle of the skillet. The mushrooms come stuffed with generous amounts of fastidiously chopped breadcrumbs, herbs, and spices mixed with finely minced crab. A hint of red pepper comes through as a surprising counterpoint to the buttery taste of the mushrooms. Upon finishing our appetizers, we sit back as our waiter combs away breadcrumbs and removes the basket of bread. Mastro’s steaks are seared at 1200 degrees to lock in juices before being broiled. All beef and chop items are U.S.D.A. Prime, hand-cut meat. Steaks range in size from a small eight-ounce filet to a forty-eight ounce Double Cut Porterhouse. Fish and seafood items are just as abundantly listed on the menu. Lobster comes in three varieties: Twin Tails, Jumbo Tail, and Live Maine Lobster. Mastro’s offers several varieties of U.S.D.C.-inspected fish and a fresh catch of the day. We order a twenty-two ounce Bone-in Rib Eye and a twenty-two ounce Rack of Lamb. The Rib Eye as listed is a huge portion served a la carte. It arrives on a buttered, sizzling, 400-degree platter. I lean back, waiting for the sizzling steam to subside. It is tender, thick, and juicy and served "medium rare plus," exactly as I have asked for it. The Rack of Lamb arrives broiled with the six large bones artfully criss-crossed and standing upright. It is served medium rare, a deep pink on the inside, and has a delicious coating of mouth-watering aromatic seasonings, including paprika, pepper and garlic. The restaurant’s dry rub blend is considered a house secret and is used on most of their meats and chops. While each entrée is served a la carte, wonderfully inventive sides are offered to complete the meal. Though not on the menu, one house signature dish is Lobster-Mashed Potatoes, featuring chunks of lobster swirled into creamy mashed potatoes. Our waiter proudly offers the dish to us. Other creative-sounding sides include Gorgonzola Mac and Cheese and Sweet Potato Fries. We order the Chef’s version of Lyonnaise Potatoes. The potatoes arrive in a deep serving bowl and look similar to a thick cut steak fry. They come sautéed with onions and are very lightly coated in salt, pepper, and a blend of seasonings. They are crunchy on the outside, fork tender on the inside. Despite our large meal we manage to save room for dessert. We order the Key Lime Pie, which proves to have a nice thick butter-flavored graham cracker crust, with an authentically yellow filling, tasting as fresh as any on the Florida Keys. The flavor is delightfully tart and offset with a generous dollop of whipped cream. Also available is Mastro’s signature dessert, a “Butter Cake” with a foundation of vanilla pound cake batter and lots of butter. Just before the cake goes in the oven, cream cheese is added to the rich batter. When the innovative creation comes out of the oven it is turned over and sprinkled with raw sugar. The sugar is then caramelized before being presented at the table with vanilla ice cream. As neither of us can finish so much food in one sitting, Mastro’s brings us designer doggy boxes beautifully wrapped in black with signature seals to remind us of our dining experience. Overall, Mastro's provides an atmosphere for quiet conversation and romantic dining, or for that very special occasion. 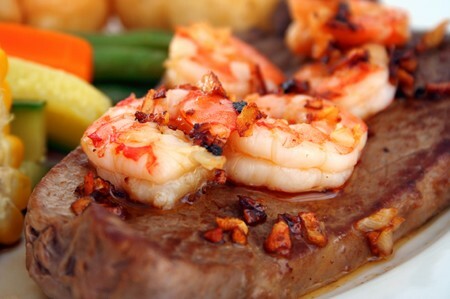 It is a quintessential steak destination for business diners. There are three semi-private rooms, which can offer intimate dining for parties as small as ten and as large as 180 guests. These rooms echo the same elegance and warmth of the main dining room. In addition to these private facilities, Mastro's also provides off-site catering. What a wonderful way to celebrate my wife's 40th Birthday!!! It was a memorable evening and worth the trip from North Carolina. The atmosphere was active, yet friendly! The staff were very accomodating and had great dinner suggestions. The Tower appetizer was a special treat! The steaks were perfect!! For a nice evening out, Mastro's City Hall Steakhouse is the perfect dining experience. The food is absolutely delicious, the servers as well as all the City Hall Staff are wonderful and the evening is completed with great entertainment that can be pleasantly heard in the main dining room. We can't wait to return! Service, food quality, and SERVICE! My glass got half empty and there was somebody to fill it up. Our server had superb knowledge of the menu and was able to describe each and every item i asked about that allowed me to make a very informed choice. The steak, which i got the 8oz petite filet which is the least expensive steak on the menu, was melt-in-your-mouth wonderful. It was cooked med rare +, in between med rare and medium, and was perfectly done. We also ordered the lobster mashed potatoes, which was AMAZING, and the serving is plenty for 2 couples. We also got the sautéed asparagus which was cooked in butter and garlic and done again perfectly. While the menu is a little pricey, the experience was absolutely wonderful. Can't wait to do it again! BTW, don't forget to bring a little cash to tip the bathroom attendants who turn on the water and pump the soap for you! If you want the absolute best steak you've ever eaten. This is the place!! The food and service were both terrific. I normally go to Flemings or Mortons, and was very impressed with Mastros. In my opinion the steak was better than at either of those restaurants. Delicious. This is a great business and date place. They have the traditional steaks with greats sides, etc. They serve big portions as well. The ambiance and bar is fab. Great place to people watch as well. Save your money make a visit. We went for my wife's 48th birthday and have been here four times before. We are never disappointed, in fact totally impressed each time. Best Steak in Phoenix. The KC strip is vantastic! I can't say enough about the service. The Wait Staff is well trained and have real personalities that shine through, thats hard to find today! oh and did I mention the Martini's are superb! There has be a lot of hype for Mastro's, but I don't understand why. It wass OK, but no better than 1 billion other steak houses. Not bad. Just not special. I was not impressed. It is very loud and cramped dining area. Steaks were OK at best.